Combine the garlic, the red onion, the lemon zest, the raspberry wine vinegar, the extra virgin olive oil, ¼ teaspoon of sea salt, and 1/8 teaspoon of black pepper in a mixing bowl. Whisk well. Taste and add more sea salt and/or black pepper, if needed. 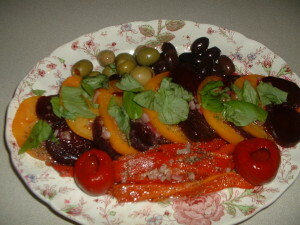 Arrange the tomato slices and the beet slices on a plate overlapping them slightly. Sprinkle evenly with ¼ teaspoon of sea salt and 1/8 teaspoon of black pepper. Pour the dressing evenly over the top of the tomato slices and the beet slices. Garnish with the basil and serve. Note: you can serve this salad with roasted red peppers and assorted olives, if desired. This recipe has the great flavor of a piccata preparation but without the work. Combine the olive oil, the garlic, the lemon zest, the parsley, the capers, the sea salt and the black pepper in a saucepan. Cook on medium heat for one minute. Add the white wine and stir well. Let the mixture cook until the wine has reduced by a half. Off the heat, whisk in the butter. Taste and add more sea salt and/or black pepper, if needed. 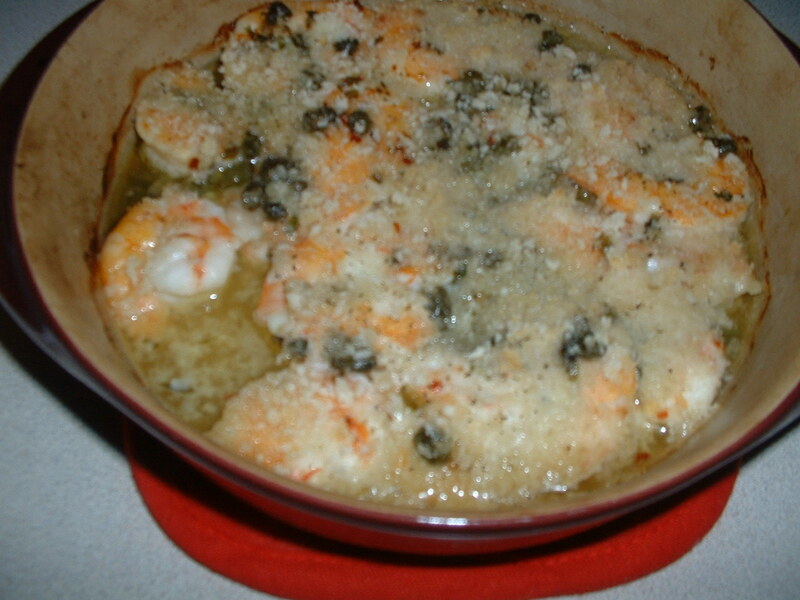 Place the shrimp into a ceramic baking dish and evenly pour the butter, wine sauce over them. Sprinkle the bread crumbs uniformly over the top of the shrimp. At this point, you can add a small amount of olive oil on top of the bread crumbs so that they become crispier when finished cooking, if desired. Bake in the preheated oven for 30 minutes. Let cool and serve with lemon wedges. I am using tomato sauce as ketchup for my burger in this recipe. I have made my own tomato sauce for this recipe but your favorite jarred tomato sauce will work well. I like the roasted red peppers to be marinated in vinegar and olive oil for extra flavor. Combine the veal, the parmesan cheese, the bread crumbs, the garlic powder, the onion powder, the oregano, the basil, the parsley, the red cayenne pepper, the sea salt and the beaten egg in a large bowl. Mix well. Form the mixture into six equal patties. Cook the veal patties on a hot grill for six minutes on each side or 12 minutes total cooking time. After 12 minutes, top each burger with a provolone cheese slice. Cook for an additional minute until the cheese melts. Remove the patties from the grill. Place the ciabatta bread on the grill cut side down. Cook the bread for one minute just to heat it slightly. To assemble, remove the warmed bread from the grill and slather both sides with an equal amount of tomato sauce. Place the arugula leaves evenly on the bottom half of the bread. Place the burgers on top of the arugula. Top the burgers equally with the roasted red pepper strips. Close the bread and press down slightly. Cut into equal pieces with a serrated knife. Serve while hot. 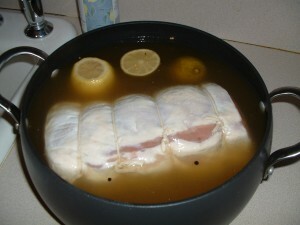 Combine the brown sugar, the sea salt, and the water in a pot large enough to hold the liquid and the pork loin. Put on high heat until the sea salt and the brown sugar dissolve. Turn off the heat. Squeeze the juice of the lemon and the lime into the pot. After squeezing the juice out, add the lemon and the lime to the pot. Add the black peppercorns, the mustard seeds, the rosemary stalk, and the thyme sprigs to the pot. Stir well. Allow this brining liquid to cool. When the mixture reaches room temperature, add the pork loin to the pot. Cover and refrigerate for at least 24 hours. 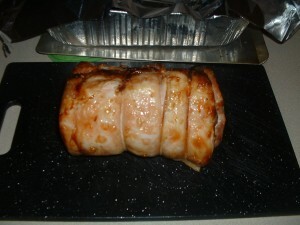 When you are ready to roast the pork loin, preheat the oven to 375 degrees. Pat the pork down well with a paper towel. Cook the pork in the oven on a rack in a roasting pan for two hours. Allow the meat to cool for at least 15 minutes before carving. Remove the butcher’s twine before slicing. Serve with a baked potato and a Caesar salad. Wrap the fillets with butcher’s twine going around each fillet twice to form a round shape. Sprinkle each fillet generously with sea salt and ground black pepper. Press the seasoning with your fingers into the meat. Put a non-stick skillet on high heat for four minutes. Add a tablespoon of olive oil to the pan. Place the fillets into the skillet. Cook without touching for three minutes until the cooked side achieves a dark brown crust. Place the mushrooms in the pan. Place the skillet in the preheated oven for 12 minutes for medium rare. Remove the fillets to a plate. Put the pan on medium low heat and add the red wine. Cook for three minutes while scraping the bottom of the pan to loosen the brown bits that have formed. Turn the heat down to low and add ½ tablespoon of unsalted butter. Stir until the butter has melted into the sauce. Take the skillet off of the heat. Taste and add more sea salt and/or black pepper, as needed. Pour the sauce right over the top of the fillets and serve. Sprinkle both sides of the scallops with sea salt and ground black pepper. Put a non-stick skillet on high heat for four minutes. Add ½ tablespoon of unsalted butter and a tablespoon of olive oil. Cook while stirring. When the butter has melted, add the sea scallops. Allow the scallops to cook without touching them for 3-4 minutes until a brown crust is formed on the cooked side. Turn the scallops over and reduce the heat to medium. Cook the scallops while basting them with the butter and the olive oil for three more minutes. Serve with lemon wedges. This pizza is a perfect way to utilize leftover tomato sauce or you can just use your favorite jarred sauce. Evenly brush the top of the pizza crust with the olive oil. Spread out the tomato sauce uniformly over the top of the pizza. Sprinkle the grated cheese equally over the sauce. You can add more grated cheese, if you desire. 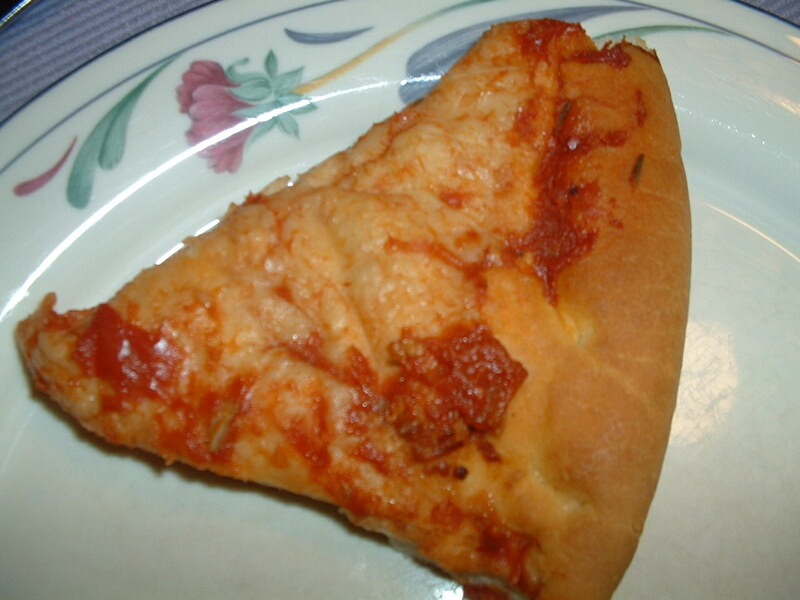 Bake in the preheated oven for 12 minutes or until the crust turns golden brown and the cheese melts slightly. Let the pizza cool for at least 5 minutes before slicing. This dish is Italian comfort food at its best. Combine the pancetta and the olive oil in a large pot. Cook on low heat until the pancetta becomes crispy. Add the potatoes and cook on medium low heat stirring frequently for three minutes. Add the onion, the tomatoes, the celery, the garlic, the sea salt, and the red pepper flakes. 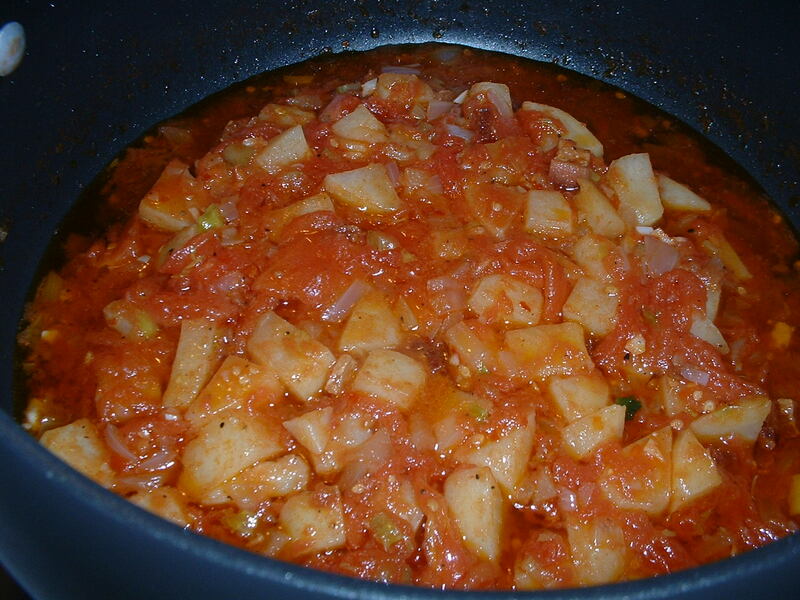 Continue to cook on medium low heat while stirring frequently until the potatoes are tender but not falling apart. Taste and add more sea salt and/or red pepper flakes, if desired. In the meantime, cook the shells in a pot of boiling, salted water according to the package instructions. 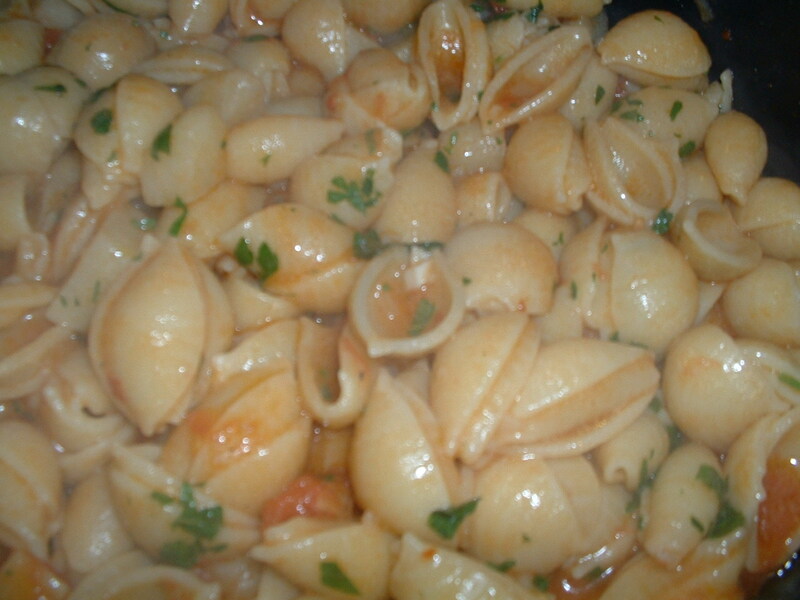 Before draining the pasta, remove one cup of the pasta cooking water and set it aside. Drain the pasta well in a colander when cooked al dente (tender but still firm to the bite). 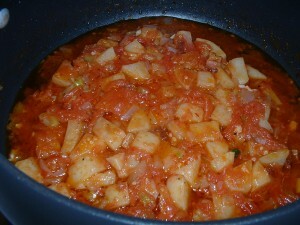 Add the cooked pasta and the pasta water to the pot with the potatoes, tomatoes, and the olive oil. 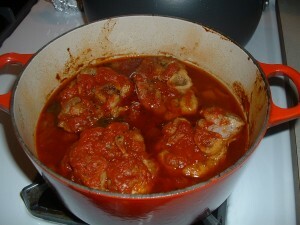 Cook on medium heat while stirring for two minutes until the sauce thickens slightly and then coats all of the shells. Add the chopped parsley and mix well. Serve with grated cheese. Season the shanks on both sides with a teaspoon of the sea salt and ¼ teaspoon of the ground black pepper. Heat the olive oil in a Dutch oven on medium high heat. Add the shanks to the pot. Brown the shanks on all sides. Transfer the pork shanks to a plate. Turn the heat down to medium. Add a pinch of sea salt, a pinch of ground black pepper, the red onion and the garlic to the pot. Cook while stirring for one minute. Add the red wine. Using a wooden spoon, scrape the bottom of the pot to loosen the brown bits that have accumulated. Add the tomato sauce, the parsley stalks, the rosemary stalk, the basil leaves, and the thyme stalks. Stir well. Return the pork shanks to the pot along with any of the meat juices that are on the plate. Cover and place the pot into the preheated oven. Bake for two hours removing the lid for the last thirty minutes of cooking time. Serve with polenta, rice, or pasta.